Here tis. Way too much time spent on this labor of love, lemme tell ya. 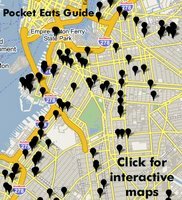 At long last, here is a two page pocket guide of the best and most lauded cheap eats in the City, organized by borough and neighborhood. It's got a handy tri-fold so it'll fit into your back pocket, ready to get grease-stained and worn. 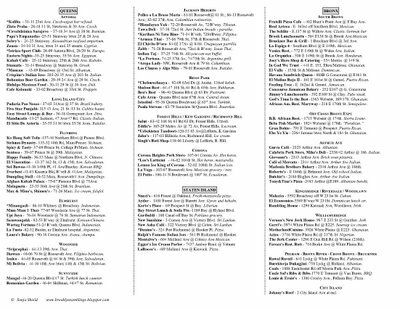 Click on each page to enlarge & print it (remember to print or photocopy it double-sided). 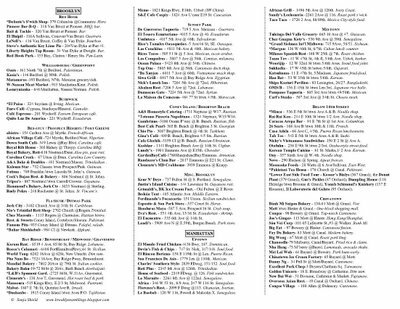 The interactive map is searchable by restaurant name or your location, and includes many great places that don't fit on my two-page pocket guide. I'm working on getting this higher quality (anyone know how to upload pdfs or docs to blogger?). Until then, if you want a better copy, email me at sonjashield@gmail.com. When are you taking me out to dinner? Seems like I won the optometrist bet.